As a young boy of Eurasian descent, Mike Banda attended the elite Trinity College in Ceylon’s (now Sri Lanka) second largest city, Kandy. Due in part to the influence of Hilary Abeyaratne, an inspirational teacher at the school, he and his younger brother Tony became activists in the Trotskyist Bolshevik Party of India, Ceylon and Burma (BLPI) whilst in their teens. The BLPI merged with the larger Lanka Sama Samaja party in 1950 to become a section of the world Trotskyist movement, the Fourth International. It was at this time that the Van der Poorten brothers departed for Britain where they joined the Group, as the British section of the Fourth International was known at the time. The Banda brothers were soon thrown into the tempestuous struggles within the post-war International. 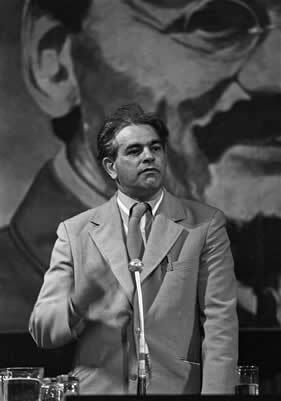 A deep split developed in the early 1950s between its secretary, Michel Pablo and his supporters, and those around the world who opposed Pablo’s accommodation to Stalinism and the liquidation of Trotskyist organisations. Banda worked tirelessly with the Group’s leader, Gerry Healy, to counter the destructive effect of the split with Pablo’s backers in the UK. Banda was an effective organiser, who helped expand the Group’s work inside the Labour Party and trade unions. He and his brother became skilled designers and printers who helped to turn out countless campaigning pamphlets, magazines and books through the organisation’s Plough Press and New Park Publications. Banda helped campaign on the Aldermaston peace marches and for the historic resolution put to the 1957 Labour Party conference by the Group’s members in the Norwood constituency. This demanded a ban on the testing and manufacture of nuclear weapons. Banda worked to transform the Group into the Socialist Labour League in 1959. The SLL’s weekly paper, the Newsletter, was promptly made banned reading by the Labour Party leadership under Hugh Gaitskill and SLL members were expelled. The Socialist Labour League’s five-year campaign for a daily newspaper reached fruition in 1969 with the launching of Workers Press. Both the Banda brothers were indispensable to the success of the campaign and in the functioning of the SLL’s Clapham-based print works. In November 1973, a founding conference launched the Workers Revolutionary Party. Banda defended the newly-formed party against an international assault aimed at the party and Healy’s efforts to develope Marxist theory. He wrote a series of significant articles rebutting efforts by ex-WRP member, Alan Thornett’s challenge to Marxist philosophy and outlook, later published in the booklet Whither Thornett? In 1978 Mike Banda became WRP general secretary when Healy stepped down. He continued to campaign around the country as well as write polemical articles for the party’s daily newspaper, the News Line and its magazine Labour Review. Banda was supported by assistant general secretary Sheila Torrance and News Line editor Alex Mitchell, while Healy took on the role of education and cadre training. The 1979 election of Margaret Thatcher meant that labour, socialist and revolutionary organisations came under intense fire, openly and through infiltration from within. Healy, with Banda’s support, fought hard to develop a dialectical Marxist approach to political change to enable party members to develop and recruit under the new political circumstances. The struggle for this approach came to a head at an international level when the leader of the US section, David North, launched an attack on materialist dialectics in October 1982, denouncing Healy’s approach as “Hegelianism”, exploring potential cracks in the leadership of the WRP. Under Banda’s leadership, the Workers Revolutionary Party organised major political campaigns in 1983, including the Marx Centenary March which culminated in a rally of thousands at Alexandra Palace. These in turn intensified the attack on the party from the state and its agencies. Recent revelations by ex-Special Branch agents have confirmed that the WRP and other left organisations were targeted during the 1980s. The pressure on the WRP in general and Banda in particular came to a traumatic head in the aftermath of the 1984-5 British miners’ strike. The party and its youth section, the Young Socialists, organised powerful marches to release the miners jailed at the end of the strike, despite Banda’s trepidations. An extraordinary rally at Alexandra Palace on 30 June 1985 brought together key protagonists and trade unionists leading the struggle against Thatcher around the country. The platform included Ted Knight, leader of the rate-capped Lambeth council, and Anne Scargill, wife of the NUM president. But with success also came a series of crises. The day after the rally, a poisonous attack was made on Healy by his personal secretary, who mysteriously disappeared. Then a yawning financial crisis came to light, provoked and manipulated by the party’s finance committee. Banda, hitherto Healy’s strongest political ally, now began to spin around politically. He proved incapable of resisting the combined pressures of a rapidly-changing political situation, a financial meltdown and massive efforts to destabilise him politically. Casting aside decades of political training, Banda now became deeply disoriented, descending to the crudest anti-Marxism and personal attacks. He thus became the instrument of the most reactionary elements in the leadership to split the WRP down the middle, opening the party door to the Fleet Street media to witch-hunt Healy, the man who had been his closest comrade. Banda and those who clustered around him in order to break up the party rapidly fell out with each other and departed from revolutionary politics altogether. In the late 1980s, Banda and his brother began to work with the Kurdish community in Britain, helping to found the Kurdistan Solidarity Committee and the Peace in Kurdistan Campaign. His health failed him in his later years and he contracted first diabetes and then Parkinson’s and Alzheimer’s disease. As someone who worked with Banda for well over a decade, I experienced him at his best and at his worst. 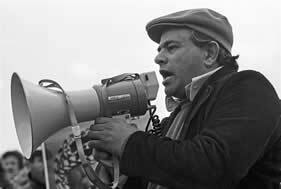 He made an inspiring contribution to the creation of a genuinely revolutionary Marxist movement in Britain over most of his lifetime. The manipulation of the WRP’s substantial assets and subsequent financial crisis played a crucial role in undermining a dedicated Marxist and revolutionary. This came together with a concerted international campaign to destroy his relationship with Healy, playing on Banda’s ego and volatile temperament. His actions in 1985 were those of someone who tragically could not cope with the tremendous pressure that revolutionaries come under at crucial moments in the class struggle. He thus ended up helping to destroy the very organisation he had worked so hard to create. Although we live under greatly changed circumstances today, it remains important to understand a life such as Banda’s. Finding ways to develop, strengthen and sustain a revolutionary approach and organisation is as great a challenge today as it was during his lifetime.